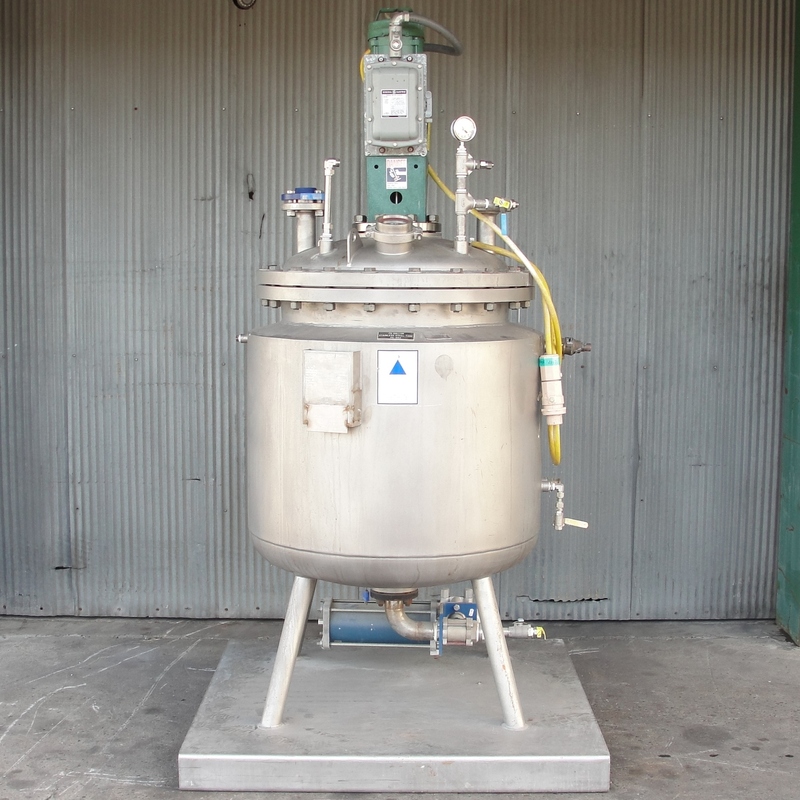 Precision Stainless Inc. 75 gallon jacketed reactor. The reactor interior, exterior, legs and base are constructed of 316L stainless steel. The internal pressure ratings for the vessel are 15 psi for temperatures of -20° F to -150° F and 50 psi for temperatures of -20° F to +450° F. The vessel is also rated for full vacuum. The interior has (4) 4″ wide baffles that run the length of the straight side. The jacket is rated for 100 psi for temperatures of -150° F to +450° F. The reactor has a diameter of 26″ and a 33″ straight side height with 6″ dish bottom and 6″ dome top. The top is flanged and bolt to the body of vessel for access. The top has (1) 4″ sight glass, (2) 2″ flanged fittings, (2) 1″ npt fittings and (5) 3/4″ npt fittings. The two side jacketed zones for supplied by (4) 1″ npt fittings. The bottom has a 3″ flanged fitting with a Janesbury pneumatically operated ball valve. The reactor is equipped with a 1.17 hp lightnin agitator. The agitator has a 1.5″ diameter shaft with a 16″ 3 blade prop. The agitator has an on/off switch with portable extension cord. The motor and switch housing are both tagged for hazardous locations. The entire unit is mounted on a 4′ x 4′ stainless steel skid. Serial # 8818-10. National Board # 1985. Overall dimensions are 48″ wide x 48″ long x 78″ tall. Requires 230/460 vac 3 phase electrical supply. Excellent condition.